Plan your next Meeting or Workshop that appropriately accommodates your attendees and will be sure to impress. 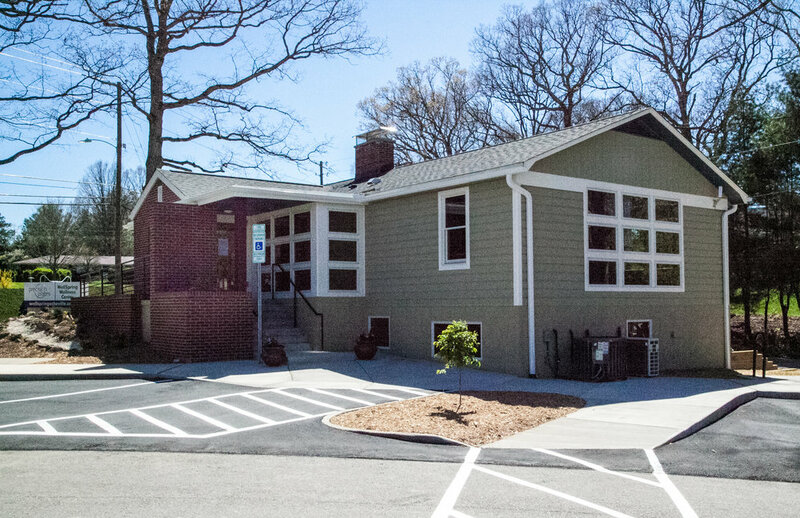 You can enjoy our campus on Tunnel Road, with almost one acre of property, conveniently located just 5 minutes from downtown East Asheville. For more information on renting a room for your next meeting or workshop, please give us a call, or fill out the form below to send us an email. Our campus includes a full kitchen, water feature, multiple decks, parking and other common areas. Our covered decks will ensure that your event does not suffer due to inclement weather. Our campus also includes uncovered decks so that your guests can take advantage of the natural sunlight, if they choose. You can choose our training room that is equipped with Smart TV technology, MAC and PC hook-ups, and a built in sound system with ceiling speakers. Alternatively we have one movement studio available that does not include technology. We also provide screen and projector rental if needed. Both rooms possess ample natural light and variable lighting with dimmers. Our rooms can be arranged classroom style to seat up to 30 guests, or horseshoe to seat up to 20. If needed, we also have 6 and 4 foot tables. Refreshment packages as well as catered lunches are available upon request. Cancellation of rented space must be done at least 30 business days before a meeting date to avoid a cancellation fee. If a cancellation occurs 29-7 business days prior, a 50% cancellation fee will be retained. If the cancellation occurs 6 business days or less, the full meeting room rental fee will be assessed. The cancellation must be received in writing or confirmed verbally with the Office Manager.